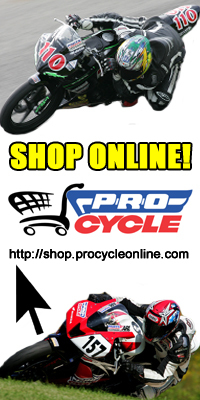 We welcome back our sponsors to the first Canadian National for the Jodi Christie Race Team. This is John Sharrard here, the crew Chief and Suspension Technician for the Team, helping out a bit more this year as Gary (Jodi’s Father) has had to take work in Saskatchewan for the season to help support the team. Gary’s absence has forced quite a few changes into the team, with Jodi having to take on much more of the preparation duties, as well as driving and making many of the decisions that are associated with Team owner. Although tough for the whole Christie family, Jodi is maturing at an alarming rate and is doing a fantastic job of filling his dad’s shoes while remaining perhaps the most talented and focused rider in the country today. We loaded up the trailer and headed for Quebec on Wednesday morning under beautiful skies. The team was in a great mood as Jodi has had great success at the regional races winning all four Pro Superbike and 600 races he has contested, as well having memories of how well the team did last year in Mirabel finishing a close second to Jordan in both the 600 and Superbike main events. We worked late into the night on Wednesday getting the pit area, flooring and awnings set up, then preparing the bikes for gearing, suspension and basic geometries as per our last years notes. The Staff at ICAR had decided to change the track layout somewhat from last year for some reason, so we were a little concerned with the new layout in terms of safety and speed. The Mirabel-ICAR circuit is not a real race track, but a series of painted corners laid out on the runway in an abandoned part of this mothballed International Airport north of Montreal. The painted circuit is then surrounded by steel armco (guardrail) to keep the cars from running into each other. Thursday dawned with weather looking unstable but dry as we took to the track for the morning 600 session. Jodi was immediately looking comfortable and came in very impressed with his bike just returned from Fast Company with an engine refresh. The bike however was not turning well as the new Pirelli rear tire is significantly larger in size than last year’s tire which threw all our chassis notes out the window. We made some changes to the ride height to compensate, but ended the shorter session a bit off the pace. Superbike saw us improve our times dramatically, then we tested a new set of brake pads Jodi wanted to try, which absorbed the rest of the session. Little did we know that we had just turned our last dry laps until the qualifying session days later. As the rains drenched the circuit, almost no one took to the track because of the dangerous conditions and the unknown changes in the weather until Sunday. It rained all Thursday and all Friday which resulted in most of the major teams parking their bikes not wanting to jeopardize their riders and equipment until they had to. The series officials announced on Saturday morning due to the dangerous track, that we would not qualify if the track was wet, but would establish grids based on historical data. Pro Sportbike (600 super sport) was a rain out, so Jodi was awarded pole position based on his incredible performances last season. Minutes before Superbike qualifying began, the track dried and we found out after many enquiries that qualifying indeed would occur. The bikes were ready, so we headed out. Jodi came in a couple laps later with a comment that the brake pads we installed two days prior were unrideable, so we scrambled to locate the old pads and reinstalled them to finish off the session. By the time we had service the front brakes, the session was winding down and Jodi quickly climbed the Superbike leader board from last to 7th place to lock in a grid spot on the second row. We really needed more dry laps, but mother nature and the timing clock didn’t really comply. Sunday morning saw rain again return to the circuit, which caused the 600 race to run as a wet or ‘open tire’ race. Again with the extreme danger of the track in the wet, it was decided to award an even number of points to all competitors regardless of where they finished, just as long as they finished, hopefully to reduce the desire for the competitors to take risks. With the poor wet visibility and sketchy traction, early race leader Alex Welsh crashed out of the lead, handing the win to Frank Trombino, while Jodi crashed out of third in a very slow corner, picking the Factory Honda up to cross the line in 6th place. Luckily, Jodi was unhurt in his fall and we switched to our ‘dry’ bike for the Superbike race as the Sun came out for the first time in days. Jodi got a decent start, but was unable to run with the lead pack of riders and finished the race uneventfully in 8th place, running similar times to the leaders by the end of the race as he benefited from the most consecutive dry laps we had all week. While Jodi was disappointed with his finish, we quickly realized all of the riders ahead of us in Superbike had made the trip to Mirabel the week before to compete in the regional race on the same track configuration, and they had all enjoyed 3 full days of Dry testing. With Honda’s severe budget cutbacks for 2011, there was just no way Jodi could make this regional round and as such mother nature caught us out. A special thank you goes out to all our sponsors who continue to support and advertise with our team, and please stay posted as we prepare for the next round from Shannonville July 3rd! Posted on June 7, 2011, in CSBK - Canadian Superbike Series. Bookmark the permalink. Leave a comment.